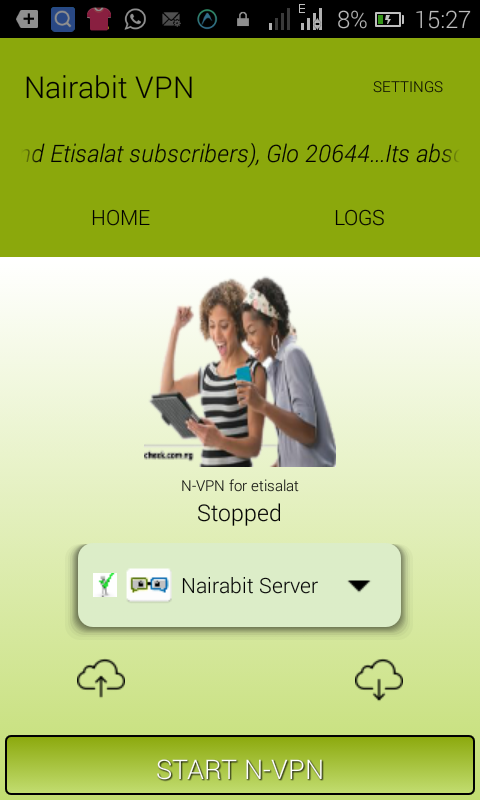 Etisalat free browsing was blazing on android and PC (via Pdanet) since June 2017 to March 2017 when unfortunately, most users of the VPN app couldn't use it for free browsing because it was blocked by etisalat Nigeria although Glo free browsing cheat is still blazing nonstop on N-VPN for glo. An update about the VPN app for etisalat was posted on the website as well as the official Facebook page claiming an update for the app will be released and here it is. The N-VPN app doesn't require any settings. Just download, install, click on "tunnel whole device method" on startup , then click on "Start N-VPN". 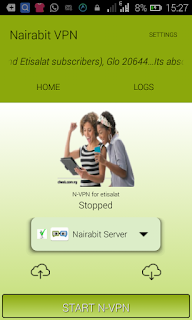 Relax and wait for N-VPN to connect then minimize and enjoy free 60Mb daily ( that's 1.8GB monthly) for free. To connect and use N-VPN to brows/download on PC,read this post I have already made. Its quite easy to setup using Pdanet. Q- Does N-VPN for etisalat require any settings? Q - The VPN app works only on Whatsapp and Facebook apps, can't I use it to download and brows with any browser? A - It only powers your social media apps because you failed to click on "tunnel whole device method" the first time you opened the VPN app after installation. Uninstall the app, then install it again, tap on "tunnel whole device method"... It should now power all your apps including browsers. 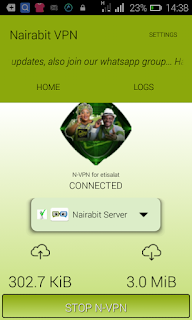 N-VPN is free and it does not require any subscription or data plan, it works with 0.0k. Enjoy this etisalat free browsing cheat while it last.